Prince Rupert British Columbia is a major port city on BC’s northern coast. It is located on Kaien Island and connected with a bridge to the mainland and is the transportation hub for land, sea and air for northern British Columbia. The Inside Passage ferry route from Vancouver Island has its northern terminus at Prince Rupert and the Alaska Marine ferry route heads north out of the city. Additionally, ferries go across to Haida Gwaii. Prince Rupert is a salt water fishing hotspot in British Columbia, as it’s on the northern salmon migration route. Plentiful and often large in size, salmon, halibut, rockfish, lingcod, crab and prawns draw visitors from around the world. Its rich fishing history can also be viewed at the heritage site of the North Pacific Cannery. Whale watching tours as well as grizzly bear tours are another favorite activity around Prince Rupert. The beautiful Khutzeymateen Sanctuary is located north east of the city, and is home to both grizzly bears and black bears. Prince Rupert is the deepest ice-free natural harbor in North America and its container port is a busy place. In the summer time, many Alaska bound cruise ships also stop at Prince Rupert. The city’s main tourist area is Cow Bay, about a three block area on the waterfront near downtown. Its quaint cow decor makes it easy to find! You can shop, have a coffee or a meal and watch the cruise ships dock right in front of you. Prince Rupert has so many attractions for all visitors to choose from. 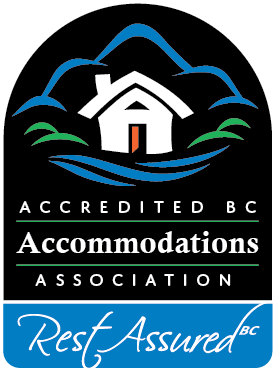 Your Prince Rupert Bed & Breakfast hosts will be the best source of information to make the most out of your stay in this northern British Columbia port city. Experience Prince Rupert on the water in historic Cow Bay at “the Lighthouse B&B”. Eagle Bluff B&B is walking distance to Prince Rupert’s museums,attractions & tours, specialty shops, gourmet restaurants and the Visitor Centre. Choice of full home-style breakfast served on your schedule.